We really have been hard at it. In fact, I don’t even know how we find the time; Stu has been putting them on when he has been pasteurising and nipping through to stir whilst they get up to temperature. It’s a team effort when it comes to ladling them out into hot, sterilised jars. 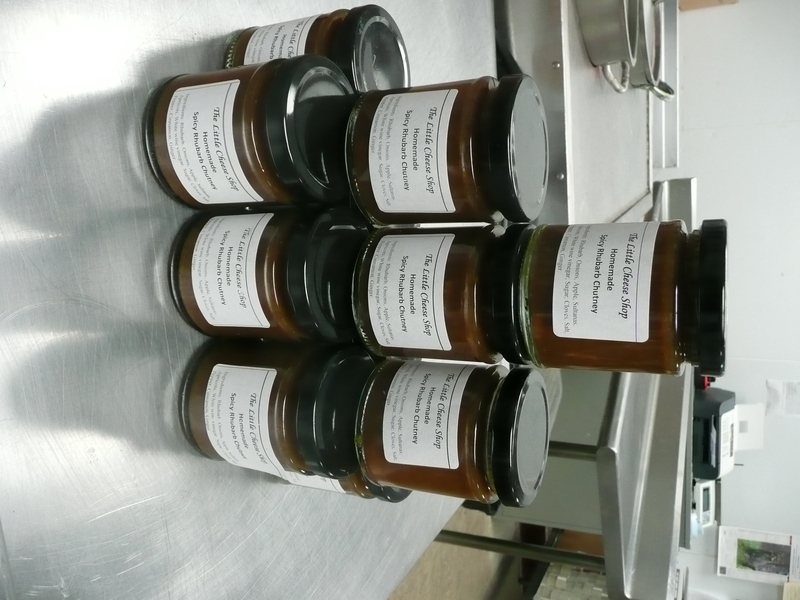 Then there is Stu’s Caramelised Red Onion Chutney which is so multi-purpose, it goes beautifully with most of our cheese and bangers and mash and is, I think, our best seller. Next week, we will be making a caramelised carrot chutney, strawberry jam and apple with ginger – can’t wait! We are a balanced team: Stu is a bit resistant to chillis and puts on a brave (or something like that!) face when sampling, I love chilli and Lydia is in between. I don’t have a sweet tooth, (ok, apart from dark chocolate, if anyone is thinking of sending any! ), Lydia does and Stu is in between, so together we make a fairly good tasting panel. Our thanks to our fruit and veg wholesalers who laughed their heads off when we asked for 10” of root ginger and 4 garlic bulbs amongst other things, but are doing us proud nonetheless. The chutneys sound wonderful especially the carrot – why can’t there be cheap postage!? Thanks, Sally, though I say it myself, the chutneys are really good – nothing artificial, no emulsifiers or thickeners or even pectin – just fruit and veg and everything is absolutely fresh. My favourite is the sweet chilli jam which kind of goes a little oily as it is cooking and turns this beautiful red colour – it is red peppers, red chillis, fresh vine tomatoes, red wine vinegar, brown sugar, fresh root ginger and fresh garlic, the red onion marmalade, really sticky and glossy in colour is made with red onions and balsamic, bit of chilli and a bit of garlic, and Stu’s smokey tomato – all very tasty, really good flavours that you don’t get in the supermarkets these days. The carrot one we already made is really good as we made sure that the carrot still has a bit of a bite to it, but it is a little hot, which I like. Can’t wait for the caramelised carrot – when I lived in Pakistan the cook there ocasionally used to make gaja ka halva which was a sort of carrot pudding, made with evaporated milk and the carrots were caramlised – absolutely out of this world, especially for someone who does not have a sweet tooth. So am looking forwards to the caramelised carrot too. I know, postage just eliminates sending stuff, especially to Portugal! How is life in Portugal? !